Wisdom teeth are the final set of molars to come in, usually during your late teens to early twenties. For some, the wisdom teeth emerge through the gums and have enough room to grow in naturally. For others, wisdom teeth can cause problems. 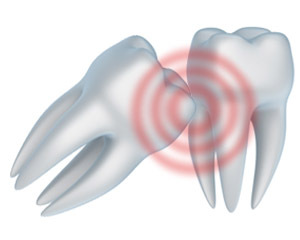 A wisdom tooth can become impacted when it comes in at an angle and not straight through the gum line. Impacted wisdom teeth can cause structural damage to the jaw and other teeth, making it necessary to remove the impacted wisdom teeth before further damage occurs. Dr. Dankworth can give you a routine x-ray during a dental exam to reveal if you will need a wisdom teeth removal. You’ll likely need your impacted wisdom tooth pulled if the wisdom teeth result in pain, infection or gum disease, tooth decay in partially erupted wisdom tooth, damage to a nearby tooth or surrounding bone, or complications with orthodontic treatments to straighten other teeth. Wisdom teeth removal is a surgical procedure where the dentist removes one or more wisdom teeth - the four permanent adult teeth located at the back corners of your mouth on the top and bottom. Even if you are not experiencing problems with an impacted wisdom tooth, your dentist may still recommend that you have your wisdom teeth extracted to avoid future problems. Serious complications with wisdom teeth happen less often in younger adults. Older adults may experience difficulty with surgery and complications after surgery. After your procedure, be sure to follow all of Dr. Dankworth’s instructions on how to heal properly. Our goal is to help make your experience with your wisdom tooth extraction as comfortable as possible. Please call or text our our office with further questions or to make an appointment regarding your wisdom teeth. We have helped hundreds of patients around Carlsbad, Encinitas, and San Marcos CA with wisdom teeth removals.